When Claire and I decided to start travelling from Colombo to Dambulla, we missed out on travelling along the scenic Colombo-Kandy Road. Luckily though, we did get to see a part of the route, thanks to our trip to the Pinnawela Elephant Orphanage from Kandy. The spectacular views of hills and valleys entertained us for the duration of the drive (about 90 minutes for 50km or so – yes, traffic moves slooooow here). 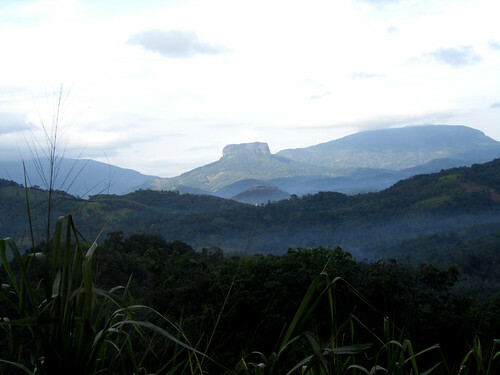 One of the most striking sights was the Batalegala Rock, standing solidly at nearly 800m tall, which is not unlike the Sigiriya Rock which we climbed just yesterday. Nicknamed the Bible Rock (something about resemblance to an open book), it was shrouded by thin layer of mist, giving it an aura of mystery and intrigue. I heard it could be scaled by those interested in mountaineering. Well, good luck!